Ian McShane's wonderful free-kick gave 10-man Ross County a crucial win against Hamilton Academical. Dutch striker Alex Schalk's first league goal for the club gave the Staggies an interval lead. Within seconds of the restart Jamie Reckord was sent off for denying Dougie Imrie a clear goalscroring opportunity. Imrie himself equalised with his sixth goal of the season but Accies were caught chasing the win and McShane showed real skill to get the winner. The win moves fourth-placed Ross County eight points clear of second-bottom Kilmarnock while Accies - just a point above Killie - next face Celtic at home on Friday. Sleet and a driving wind hardly helped the players produce silky soccer on a pitch that cut up badly as a result of the battering it has taken from the elements this winter. It was perspiration rather than inspiration for the first half-hour before a flurry of activity at either end of the field. Hamilton goalkeeper Michael McGovern produced a top drawer save when Liam Boyce thought he has scored after being set up by Schalk. Almost immediately Ali Crawford fizzed a shot just wide of the home goal. Scott Fox had to tip a Darren Lyon cross over the bar before Gramoz Kurtaj caused problems for the Staggies keeper with a near-post drive. Fox injured himself in the process of dealing with that but Crawford did not spot him on the deck and failed to hit target from the edge of the area. Jim McIntyre's side made the most of that let-off by taking the lead as the first half spilled into added time. Richard Foster played in a free-kick from deep, Andrew Davies headed it across the danger area and Schalk nodded home for his first goal since scoring against Celtic in the League Cup semi-final. However, the Staggies' lead always looked fragile from the start of the second half after Reckord picked up a straight red card for a professional foul on Imrie. Hamilton laid siege to the Ross County goal and only a block on the line by Paul Quinn prevented Lucas Tagliapietra heading in a quick leveller. Fox also made two great saves to deny Accies, the first from Crawford's free-kick and the second dealing with Imrie's net-bound effort. Imrie finally got the goal his industry and determination deserved when he headed in a Kurtaj cross. Accies pushed for a winner but were caught out on the counter attack as Ross County won a free-kick 22 yards from goal, left of centre field. McShane showed sublime skill to curl the ball round the defensive wall into the top left-hand corner of the net, giving McGovern no chance. And it proved to be a massive blow for Hamilton, who have taken just seven points from their last 11 league matches. Match ends, Ross County 2, Hamilton Academical 1. Second Half ends, Ross County 2, Hamilton Academical 1. Jackson Irvine (Ross County) wins a free kick in the defensive half. Foul by Darian MacKinnon (Hamilton Academical). Attempt missed. David Goodwillie (Ross County) right footed shot from outside the box is close, but misses to the right. Attempt saved. Oumar Diaby (Hamilton Academical) right footed shot from outside the box is saved in the centre of the goal. Oumar Diaby (Hamilton Academical) wins a free kick on the right wing. Foul by Chris Robertson (Ross County). David Goodwillie (Ross County) wins a free kick in the defensive half. Foul by Lucas (Hamilton Academical). Paul Quinn (Ross County) wins a free kick in the defensive half. Foul by Oumar Diaby (Hamilton Academical). Andrew Davies (Ross County) wins a free kick in the attacking half. Foul by Alejandro D'Acol (Hamilton Academical). Foul by David Goodwillie (Ross County). Darian MacKinnon (Hamilton Academical) wins a free kick in the defensive half. Foul by Andrew Davies (Ross County). Oumar Diaby (Hamilton Academical) wins a free kick on the left wing. Substitution, Ross County. David Goodwillie replaces Liam Boyce. Substitution, Hamilton Academical. Greg Docherty replaces Gramoz Kurtaj. Jackson Irvine (Ross County) wins a free kick on the right wing. Foul by Jesus Garcia Tena (Hamilton Academical). Paul Quinn (Ross County) is shown the yellow card for a bad foul. Foul by Paul Quinn (Ross County). Alejandro D'Acol (Hamilton Academical) wins a free kick in the attacking half. Foul by Martin Woods (Ross County). Oumar Diaby (Hamilton Academical) wins a free kick in the attacking half. Goal! Ross County 2, Hamilton Academical 1. 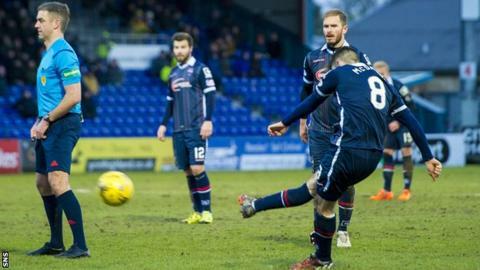 Ian McShane (Ross County) from a free kick with a right footed shot to the top left corner. Corner, Ross County. Conceded by Jesus Garcia Tena. Andrew Davies (Ross County) is shown the yellow card for a bad foul. Ziggy Gordon (Hamilton Academical) wins a free kick in the defensive half. Attempt missed. Ali Crawford (Hamilton Academical) left footed shot from outside the box is close, but misses to the left. Stewart Murdoch (Ross County) wins a free kick in the attacking half. Foul by Dougie Imrie (Hamilton Academical). Substitution, Hamilton Academical. Oumar Diaby replaces Carlton Morris. Goal! Ross County 1, Hamilton Academical 1. Dougie Imrie (Hamilton Academical) header from the centre of the box to the bottom left corner. Assisted by Antons Kurakins. Liam Boyce (Ross County) wins a free kick in the defensive half.